While this is a very interesting story with compelling characters and a familiar, yet twisted plot, I found the pacing to be dragged out to the point where one could tell that the story would continue on in a future book. Heloise is a protagonist who must grow up after a series of life-changing events alters her viewpoint of the world she lives in. However, this is NOT your typical rebellion story; and, it does NOT contain the tropes one could expect from a story like this one. That being said, the first novella in this series is drawn out to the point where you're relieved it is over, but still wanting to read the next part. 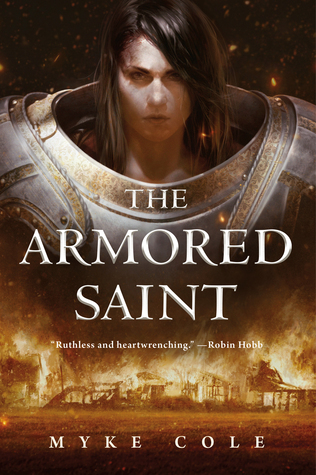 "The Armored Saint" is worth reading because you can go on to the next book, immediately. So, if you want to read a story that is predictable, but not predictable, then I recommend reading "The Armored Saint." Just have the next novella on hand so you can read that one as soon as you complete the first one. Sign into Goodreads to see if any of your friends have read The Armored Saint.